I’m so excited! 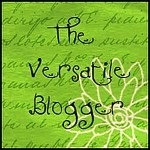 My little corner of the intrawebs has received the Versatile Blogger award, bestowed on me by the awesome Debra Kristi! It’s my first award, not only for the blog, but for anything really. I did a happy dance when I saw my name listed there, let me tell you. Thank you so much, Debra, for honoring me and for stopping by to encourage me. It’s nice to feel like I’m not alone out here in the big wide world of webs. 1. If a book gets too tense I will flip forward to the last few pages to find out how it ends before I continue reading the story. No, this doesn’t in any way diminish the suspense for me; it just means I can focus on the story without having a heart attack. 2. As a child, I loved horror movies until I saw The Exorcist on TV. I left the room when her head started spinning and haven’t touched a true horror film since. 3. I am addicted to Dove Dark Chocolate. It’s the only candy I have a true craving for. I let the small square from heaven melt on my tongue until it dissolves into nothing, usually with my eyes closed. Pure bliss. 4. I once was the proud mommy to 24 cats. I was 16, and only one of them was allowed in the house. The rest were barn cats. All of them had names, and all of them were coddled beyond what might be expected for a barn cat. 5. My first car was a turquoise Datsun B210. No, they don’t make those anymore. I don’t think they made them then, either. Pretty sure mine was a holdover from the 60s. I have, however, seen that exact shade of turquoise on the road recently. The color must be making a comeback. Unfortunately. 6. I once had both ears double-pierced. The pain it caused was so excruciating that I let the second hole grow back in and swore off any other piercings. 7. I have an autographed, leather-bound edition of The Hitchhiker’s Guide to the Galaxy. It’s one of my most treasured possessions. I was giddy with excitement the day I met Douglas Adams. I was in college, and he was promoting his non-fiction book The Last Chance To See. I’m sure he’d rather I have handed him a copy of the non-fiction book, but who could pass up the opportunity to have him sign Hitchhiker? He’s yet another one on my list of those Gone Too Soon. I’ll be paying this award forward, but not today. I thought I’d leave the soon to be recipients in suspense for a week or two. Actually, there are just so many of them out there I want to give this task my full and undivided attention. In the meantime, thank you again to Debra (If you haven’t seen her blog, please go check it out) and everyone who has supported me in this blogging adventure. I’m honored, and blessed, that you make me a part of your day.